This Cool Cash is in a vibrant shopping area on Newport Ave and E Main Street, next to Edward’s Paint. Orange County Transit Authority’s bus line #79 has a stop in front of this location at Main-Newport. Check their website for more details. This Cool Cash neighbors Wahoo’s Fish Tacos, The Flame Broiler, Baskin-Robbins, and Bagel Me. LoanMart Provides Auto Title Loans in Tustin! Have you been kept awake at night worrying about money? Has it become a challenge to keep up with the bills? Tustin residents in need of emergency funds can turn to LoanMart. They may help you use your qualifying vehicle’s free-and-clear title as collateral in order to secure up to $30,0001 in funding with an auto title loan in Tustin. Depending on the time of day you apply and submit your information, you may be able to collect your money in as little as one business day3. Don’t let an ugly financial situation get the best of you. Apply for an auto title loan with LoanMart today, and find out for yourself how much LoanMart could do to help! Just call to get started, or submit an information request form online via computer, tablet, or smart device. After you’re approved, your LoanMart rep will converse with you about how to retrieve your title loan check with LoanMart and Cool Cash! 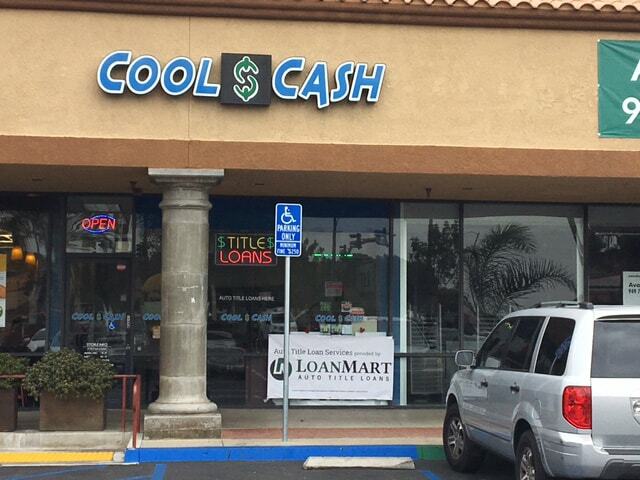 If you need to get emergency funding right now, come on down to Cool Cash and get an 800LoanMart title loan today!